other happy. We have always had dogs. Life would not be the same with out them. Don't forget lowering blood pressure also! Plus I think my Pug- his name is Eric, is better then any antidepressant! 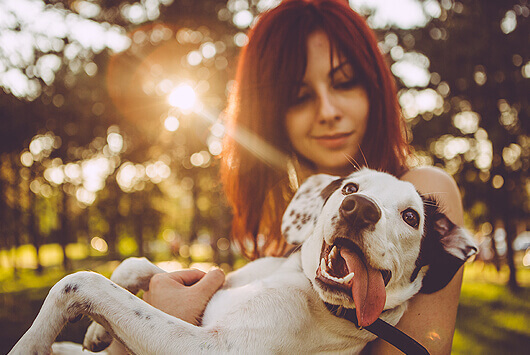 There are so many health benefits of having a pet. I call my dog my "4-legged personal trainer" b/c even after a long day and being tired - I know I need to get him out for some exercise. Always feel better when I do. Didn't know about the reduced rate of eczema! I just had hernia surgery and when I came home later that day our Corgi Alice just keep sniffing me and acting different than usual she knew there was something different about me she seems to be very sensitive to some things when I go out for my walks and I come back she is always sniffing me like trying to find out where I've been I do see some other dogs when I'm out walking that my friends have and smart Alice sure knows it. My dog Diva, Australian Shepard/terrier mix , o have had her since she was 8 weeks old. When we went to bed at night she would wake me up by jumping and barking on my chest. Long story short, it ended up I had severe sleep apnea. I stopped breathing every other min. She would wake me every time o stopped breathing. Now o have a machine and we both get more sleep! !